Though an abundance of historical reminiscence and a mass of soul-stirring legend lay in the storehouse of Jewish literature, none of it was built into a heroic poem. 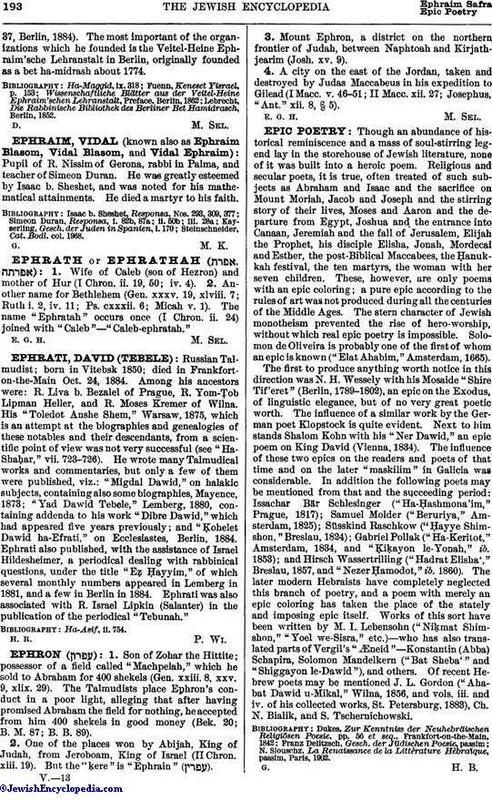 Religious and secular poets, it is true, often treated of such subjects as Abraham and Isaac and the sacrifice on Mount Moriah, Jacob and Joseph and the stirring story of their lives, Moses and Aaron and the departure from Egypt, Joshua and the entrance into Canaan, Jeremiah and the fall of Jerusalem, Elijah the Prophet, his disciple Elisha, Jonah, Mordecai and Esther, the post-Biblical Maccabees, the Ḥanukkah festival, the ten martyrs, the woman with her seven children. These, however, are only poems with an epic coloring; a pure epic according to the rules of art was not produced during all the centuries of the Middle Ages. The stern character of Jewish monotheism prevented the rise of hero-worship, without which real epic poetry is impossible. Solomon de Oliveira is probably one of the first of whom an epic is known ("Elat Ahabim," Amsterdam, 1665). The first to produce anything worth notice in this direction was N. H. Wessely with his Mosaide "Shire Tif'eret" (Berlin, 1789-1802), an epic on the Exodus, of linguistic elegance, but of no very great poetic worth. The influence of a similar work by the German poet Klopstock is quite evident. Next to him stands Shalom Kohn with his "Ner Dawid," an epic poem on King David (Vienna, 1834). The influence of these two epics on the readers and poets of that time and on the later "maskilim" in Galicia was considerable. In addition the following poets may be mentioned from that and the succeeding period: Issachar Bär Schlesinger ("Ha-Ḥashmona'im," Prague, 1817); Samuel Molder ("Beruriya," Amsterdam, 1825); Süsskind Raschkow ("Ḥayye Shimshon," Breslau, 1824); Gabriel Pollak ("Ha-Keritot," Amsterdam, 1834, and "Ḳiḳayon le-Yonah," ib. 1853); and Hirsch Wassertrilling ("Hadrat Elisha'," Breslau, 1857, and "Nezer Ḥamodot," ib. 1860). The later modern Hebraists have completely neglected this branch of poetry, and a poem with merely an epic coloring has taken the place of the stately and imposing epic itself. Works of this sort have been written by M. I. Lebensohn ("Niḳmat Shimshon," "Yoel we-Sisra," etc. )—who has also translated parts of Vergil's "Æneid"—Konstantin (Abba) Schapira, Solomon Mandelkern ("Bat Sheba'" and "Shiggayon le-Dawid"), and others. Of recent Hebrew poets may be mentioned J. L. Gordon ("Ahabat Dawid u-Mikal," Wilna, 1856, and vols. iii. and iv. of his collected works, St. Petersburg, 1883), Ch. N. Bialik, and S. Tschernichowski. N. Slouschz, La Renaissance de la Littérature Hébraïque, passim, Paris, 1902.